In his show at CRG Gallery, Robert Buck, formerly known as Robert Beck, revives a tradition as American as the traveling salesman and the wild frontier: the reinvention of self. Using markers and materials that signify the commercialism and globalization creeping into our lives, he’s created a system of metaphors that he rearranges to show how we become ourselves. The title of the show translates roughly to “second nature” in Chinese, which carries multiple allusions: to Buck’s own metamorphosis, to the role that the Asian market plays in steering the art world and to general identity issues as perpetuated through the work itself. 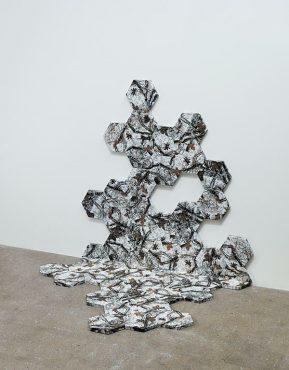 Transience, changeability and camouflage are themes that echo throughout the exhibition. Cell (Winter Mimicry 1.0) consists of several groupings of small hexagonal canvasses printed with stock images of moths blending into various backgrounds, perhaps as a nod to the way artists graft elements of others’ work onto their own. Constellation “To Find the Western Path, Right Thro the Gates of Wrath” uses metal rails to link, among other objects, a steer skull, a suitcase, a blank tombstone in the shape of a book and a framed Magic Eye poster (where you focus on a 2-D pattern to get a 3-D effect). Buck has also created a print edition from pages out of his last exhibition’s guest book, exposing the way visitors identified themselves. Through a wide variety of approaches, including changing his name, his message is clear: We are who we choose to be.